SRAM XO REAR DERAILLEUR DEAL!! I’ve been a SRAM user for years…even back in the day when they were called ‘Gripshift’ and only a few bikes had those new suspension fork thingys. I run SRAM on my race and trail bikes, and the accuracy and reliability of the crisp shifting has been something that I’ve grown accustomed too. The SRAM XO Rear Derailleur (offered here in the 8/9 speed short cage version) is not only lighter than it’s competitor (at 192 grams), but it’s carbon cage and gold bolt make it stand out on your bike. When matched with the SRAM XO Twist Shifters or the SRAM XO Trigger Shifters this little unit makes shifting your bike an almost intutive process. Oh, and I almost forgot to mention that we are presenting them the Mountains Plus customer at a 42% discount. 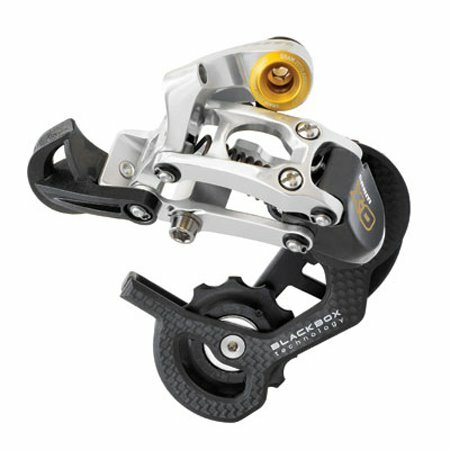 $149 for what we think is the best shifting rear derailleur out there. When we can find the good deals on the products we like and use, we do our best to pass that saving on to our customers. The SRAM XO Rear Derailleur is our choice for high quality performance and hassle free shifting. « Save 15% on Kurt Kinetic Limited Edition Fluid Trainer! !